Wishing everyone a Happy 2017. May 2017 be better than 2016. Let us hope for a better world, peace in every corner of the Earth. Thank you for your support throughout 2016. Anyone has set new goals/ new resolutions for the new year? I don't set myself any resolutions since many years ago. I can never keep up! The 'desire fire' burn out as soon as I put down the pen on the first day of the year :( , so I'll just go with the flow. Anyone who knows me, will know that I have a weakness for everything and anything sweet! Sweet Potato Pecan Pie! Adapted with a tweak or two ;P, from Tyler Florence of Food Network. Sweet potato pie has almost the same taste as pumpkin pie, I would not know the difference if both were presented side by side. Perhaps I should try bake both... just to feed on my curiosity ;P.
Do not refrigerate the flesh of 'just' and nicely roasted sweet potatoes. Moisture gets in and sweet potato filling will be gluggy! 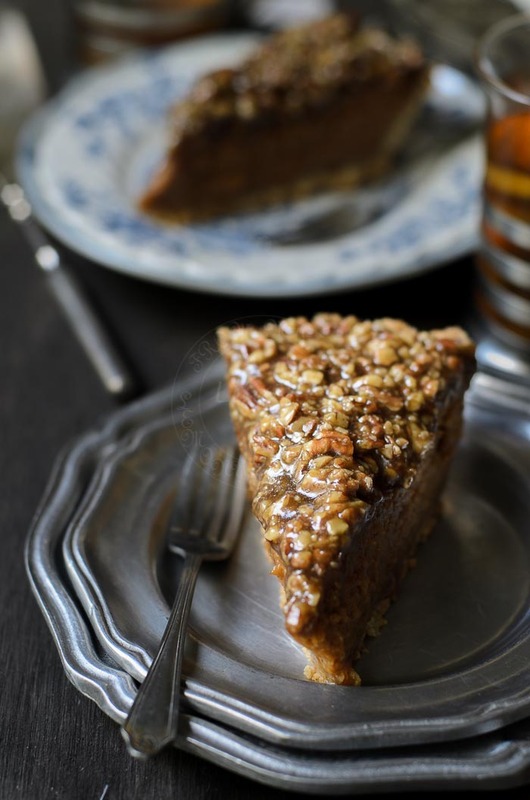 Sweet and dense sweet potato pie with pecan crust topping. Mix flour, pecan, sugar, salt and butter in a mixing bowl. Rub the butter pieces between your fingers and thumbs until the mixture resembles bread crumbs. Add cold water and knead until the mixture holds together into a dough. Gently pick up and press into a 9 inch pie pan. Trim the excess and crimp the edges. Prick the base. Line pie with greaseproof paper and add pie weight. Blind bake for 10 minutes, remove the pie weights and re-bake for another 10 minutes. Scrub clean, and wipe dry sweet potatoes. Bake potato for 45 minutes until soft and tender. Allow potato to cool before slicing in half and carefully scoop out the sweet potato flesh into a food processor. Keep the sweet potato skins. Add eggs, cream, brown sugar, golden syrup, spices and vanilla extract. Bake for 40 minutes until the centre is set. Leave to cool completely then refrigerate. In a small pan, melt butter, add sugar, syrup and salt. Stir until sugar dissolves then add pecan. Remove from heat and leave it to cool for 5 minutes before pouring onto the bakes sweet potato pie. Happy New Year to you too, Lisa. Sweet potato and pecan are simply great together. That pecan topping looks absolutely irresistible. Happy New Year to you Lisa!! This looks delicious!